An apartment block in Douglas was evacuated after a fire started in a toaster on the third floor. 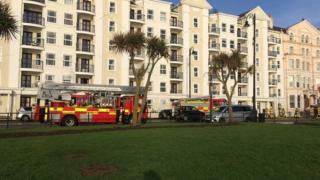 Firefighters were called to the seven-storey building on Queen's Promenade at about 10:30 GMT. A spokesman for Island of Man Fire and Rescue Service praised "quick-thinking neighbours" who helped a resident with mobility problems to safety. There were no injuries, although one person was taken to hospital as a precaution.